I just realized I haven’t been posting about my monthly favourites for a while now, so I want to share with you my March favourites. These bad boys I have been using a lot during the month of March. 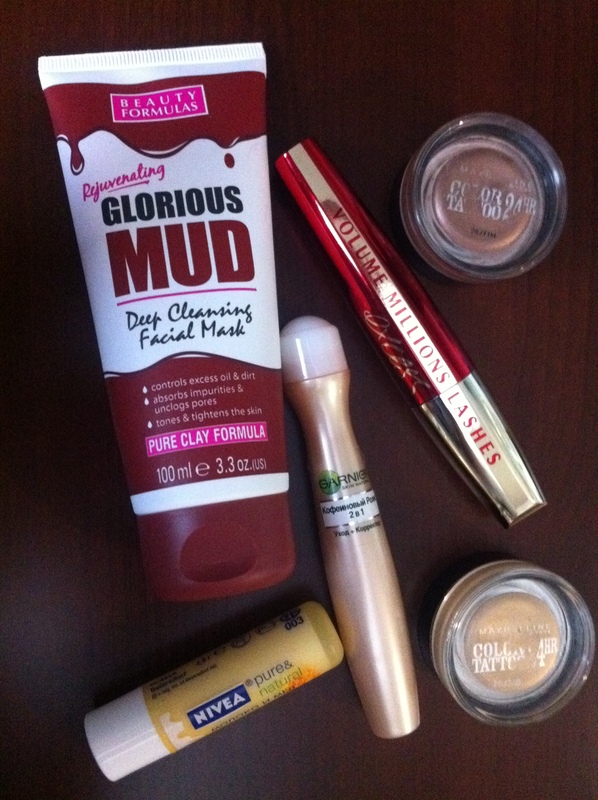 I would like to start with Glorious Mud facial mask by Beauty Formulas. I love BF products – they are good for my skin, they don’t break me out and they are very affordable. And this mask is not an exception – it leaves my skin soft, deeply cleaned, poreless and matte. It’s perfect if you have oily or acne-prone skin. Mine is oily, so I use this stuff once or twice a week and my skin loves it. Another favourite of mine is Nivea lip balm in ‘Milk & Honey’. I told you guys that my skin is oily. But there is one dry patch on my face – my lips. If your lips also tend to get chapped a lot, definitely try this balm – it’s VERY moisturising, smells lovely and costs approximately $2! Before moving towards my makeup favourites, I would like to mention a fabulous product that is just in between. Yeap, I am talking about Garnier roll-on concealer for the under eye area. It’s the best concealer for covering up dark circles, also it moisturises the tender skin so well. I am definitely going to repurchase that as soon as I run out of it. It’s like a good concealer and an eye cream in one bottle! Also, I would like to mention Volume Millions Lashes Excess Mascara by L’oreal. I’ve been using it a lot in March. I am very pleased with the quality and the brush. You can do any look with it – it can make your lashes look very natural, or if you put more coats, you get a more dramatic took, which I love. Like any other L’oreal Mascara, this one is very good. And finally, my Maybelline Color Tattoos cream eyeshadows. I got these in summer and I used them a lot. But recently I started using them again as an eyeshadow base. These babies really make my Naked2 palette pop. If I do an everyday look, I would use the golden Color Tattoo eyshadow (sorry, don’t remember the name), but if I am doing a smokey eye, I would sweep the bronzy color all over my lid and then apply something like ‘Busted’ or ‘Snakebite’ from Naked2. So yeah, these are my March favourites.